A short growing season and frigid winters make greenhouse gardening in the state of Minnesota an idea worth considering. In the southern reaches of the state, the growing season lasts a short 160 days, but in the northern sections of the state, gardeners are lucky if they get 100 days. Using a greenhouse to get a head start on the growing season is one reason to consider a greenhouse. 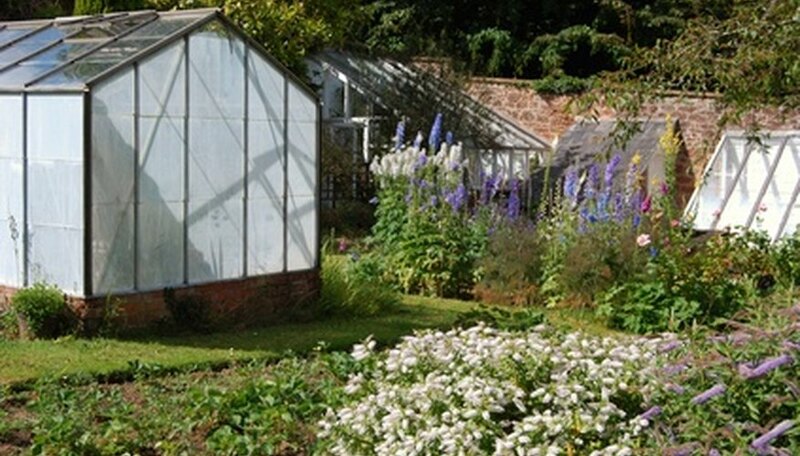 Greenhouses also offer a solution if you want to enjoy vegetables or gardening all year-round. The best location for a greenhouse is in a spot that gets at least three hours of winter sunlight a day. A south or southeast-facing greenhouse works ideally for Minnesota. You also want to choose a location that offers you easy access to the greenhouse from your home so you don’t have to tramp through feet of snow or walk a long way in a blizzard to take care of your plants. Greenhouse styles range from window boxes to complete stand-alone structures. You can also build lean-to structures that keep one side of the greenhouse attached to the wall of your home. These structures work well if you have a door you can build the greenhouse around to make it easy to take care of your plants. Greenhouses built on the ground require a frame, a cover and a base. The base can be made of concrete, wood or metal. It can be portable or a permanent foundation. On top of this foundation goes the frame for the greenhouse. The frame is made from wood, aluminum, steel or plastic pipe materials. If you want to use plastic pipe, make sure your greenhouse is sheltered from strong winds or large amounts of snow, or the greenhouse may not withstand the bad weather. Once you’ve built your greenhouse frame, you need to cover it to keep the necessary heat and humidity inside so your plants can grow and thrive. Depending on your budget and the type of greenhouse you build, covers made from glass or fiberglass can be used. Or, use plastic film for a budget-conscious solution. Double-wall plastics are another option. Before building a greenhouse in your yard, find out if your county or city has created any regulations on new construction. For gardeners who live in a community governed by a covenant, check with the homeowners association first. Electricity and running water are two of the biggest money-gobbling utilities required in a greenhouse. A greenhouse requires heat in the spring, fall and winter. Plus, you’ll need to water your plants by hand or with an automatic sprinkler system. You may also need a mister to keep plants humid, especially during Minnesota’s dry winter weather. What Vegetables Are Early Planting Vegetables?